Do you have Gremlins too? I have had the sort of spell with my sewing (and knitting!) that makes me think that there are forces at work to prevent me from making progress. Bits of pattern seem to walk off alone, instructions go missing, and knitting patterns go missing from the bag. It would be nice to blame someone else but I suspect it is happening because I feel so disorganised at the moment. I have been trying to be organised, but clearly not hard enough. My workroom usually looks OK as it has to be ‘within bounds’ for when clients come for fittings and such. Not so my ‘back room’. OMG it is a mess. This is where all of my fabric, patterns, magazines, and frankly anything else I can’t find a home for tends to lurk. I know that I am better at starting projects than finishing – and that tends to get as far as the planning stage where I have got the pattern drawn/copied, found fabric and notions, and….. ground to a halt with it all in a pile. Add multiple projects into the mix and you can see why it has gotten into a state. Well, I decided that it couldn’t carry on. Inside every Mess Monster is a tidy beast who really wants to get out. Or so I decided. Digging through a pile of papers (a very wobbly pile it has to be said) I discovered the pattern pieces for multiple projects still in my dreams, and also the paper pieces and fabric pieces for a bucket hat that was cut out before we went to the USA. I found the pattern on Rhondas blog, but it was from a site called ‘Lost in Paris’ and the link to Rhondas tutorial is HERE .I did take two of these with me and this one was clearly left behind with not enough time to make up. I abandoned the mess and spent less than an hour sewing this into a hat, and also putting the pieces (all sizes – now correctly marked) into an envelope and into the right place. Score! Multiple stray pieces now turned into a tidy pattern and a hat that can be worn. That can live in The Managements car – he has a sporty two seater which has a roof which folds off and when it does I inevitably end up with the sun in my eyes. One thing I was reminded of while I was making this hat was how I mark seam allowances that aren’t standard – or just aren’t marked on your sewing machine. It isn’t particularly clever, and I’m sure loads of you already do this, but this is so simple it’s almost not obvious. I use Post It notes (Sticky notes) with the sticky edge along the point that the fabric slides against. I already have a magnetic seam guide which is brilliant on my old Singer machines but not quite so amazing on modern machines. I sometimes use the ‘quilting bar’ thingy to guide wider seams but sometimes that isn’t wide enough. Again, the Post It comes to the rescue. And they are dirt cheap so I’m happy to throw them away once they loose their ‘stick’. I have an enormous pile of pictures pulled out of magazines and newspapers of garments/outfits I like. I could probably use Pinterest or some other clever electronic way of storing these to good effect but I actually enjoy just leafing through a pile of these pictures from time to time to see what jumps out. Sometimes it’s not obvious, or something has past its ‘sell by date’ and can be thrown away. If I had just put all of these straight into the folder where they live there wouldn’t be half the problem – but it seems quicker sometimes just to drop them on the pile in the right room. More haste less speed? I also have boxes that my magazines are meant to live in. The copies of Burda are mainly in their box – but occasionally I do get one out just to check the actual picture against my interpretation of the scanned sheet from the magazine. Again, it would be so easy just to put it straight away rather than just adding to the pile. Are you getting a theme here? If I can keep up the sorting and tidying I am sure it will make me more productive. I could never ‘Kondo’ but I can certainly see the benefit of getting shot of some of the clutter in here. There are projects (with pattern and fabric at the ready) that I had totally forgotten about. It’s truly shameful. The client work is thinning out a bit – although there has been a tendency for some of my clients to come with a ‘shipping order’ now that they know that time is limited. That certainly wasn’t part of my plan! 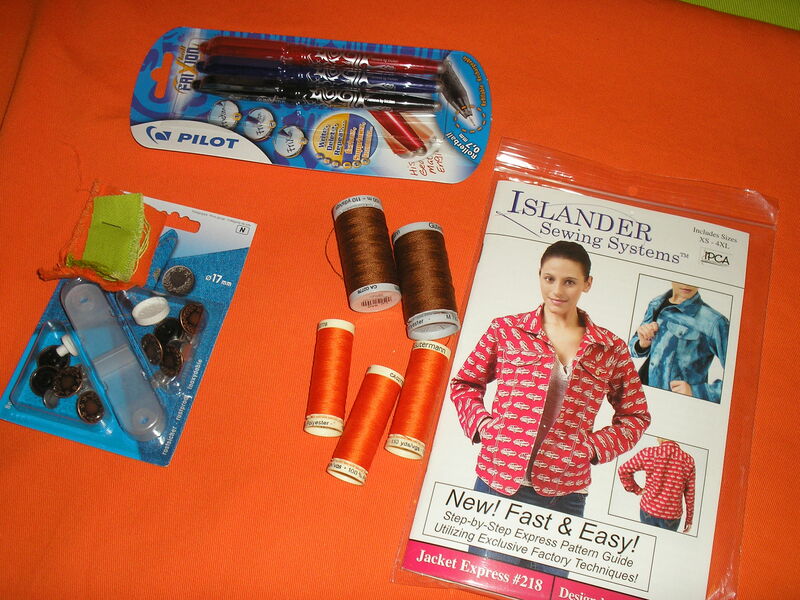 If I can actually plan my sewing as an extra ‘client’ I am more likely to actually shift some of these. I have always said that I don’t have UFO’s – do these count? If they do I have LOADS of UFO’s! Oh dear. As it has started to get colder here now I have started to dig out my jumpers. I do wear them during cool summer evenings rather than a coat, but as I am a fairly warm person they have been tucked away for a little while. Imagine then my horror when I got my lovely brown Larry out the other day and discovered a hole in it. Right in the centre of the front. No hiding that! It is a fairly neat hole so I wonder if I have actually cut one of the loops whilst I have been sewing and not noticed. I have checked all over and can’t find any more so I don’t think it’s moth. I loved this sweater but it had got a bit large (I have shrunk a bit but not too much so I think it has grown), and it was a pretty expensive Rowan yarn so I am thinking of pulling this out to re-knit. Kate from Fabrickated has been knitting lately, and seeing all of her posts relating to knitting has been making me want to start a new project so maybe I should concentrate on this. Tea and warm crust. Yum! Thankfully not everything has been working against me. My sourdough starter, from which I make bread and cakes, has been behaving beautifully. 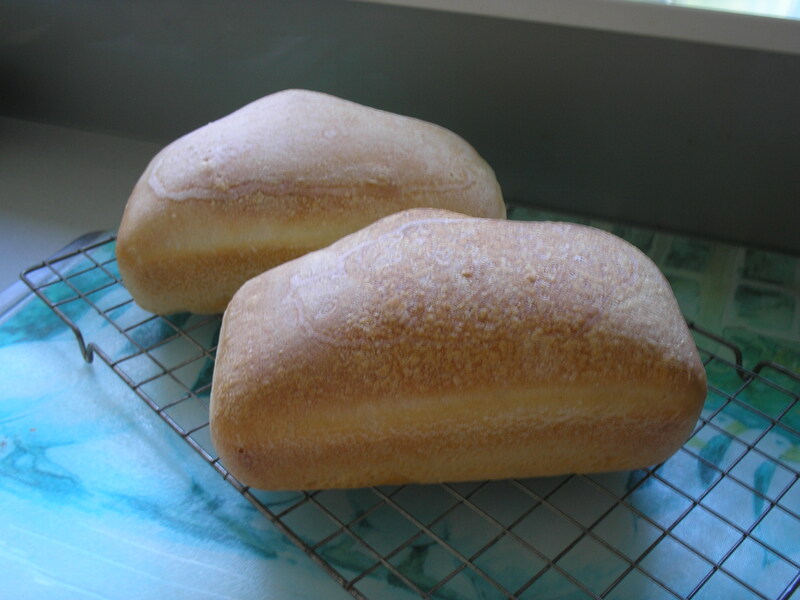 I may just be imagining it but I find sour dough bread easier to digest than store bought bread – maybe something to do with being allowed to take ages to go through the making process? Anyway, my loaves came out of the oven in fine shape, and since The Management wasn’t around I got first dibs on the still warm crust with butter. Delicious! So, maybe I just need to be better organised and that darned Gremlin will move out! A Post about cake. Sourdough cake. I really should have taken my photograph before the hungry hoards arrived! However, the cake stand had been filled on both layers with my own lemon cake adaption of the chocolate cake recipe from King Arthur Flour website. 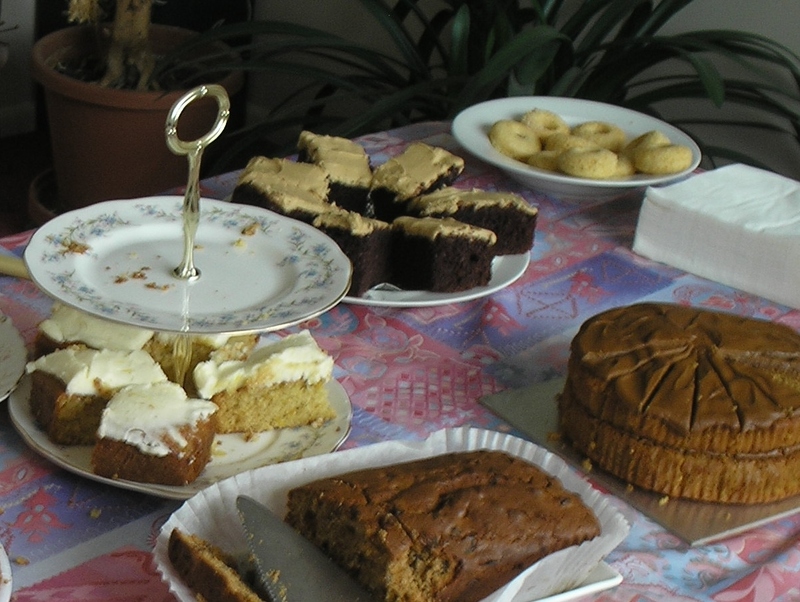 You can see the plate of chocolate cake just behind and to the right of the cake stand. The chocolate cake has been declared the ‘best in the world – all of the world’ by my nieces boyfriend and is always popular Chez Hood. It was only after several batches I decided I was going to have to find an alternative before The Management decided he was bored with it. Truly, I didn’t want to find another recipe as this one is so easy and I have found it pretty much foolproof.So…. If you use the recipe from the link and make the following changes I have made a Lemon cake (declared the best today), and an Apple and Cinnamon version. Don’t add the baking cocoa – replace it with flour. Don’t add the espresso powder either. Add the grated zest and all the juice from 2 lemons. (Mine were fairly small but gave lots of juice). For the icing (I only used 1/2 quantity) leave out the espresso powder and use zest/juice from 1 lemon. Don’t add the baking cocoa – replace it with flour. Miss out the espresso option. Add 8oz of grated apple (or rough quantity – I used eating rather than cooking apples but either would work), 1 teaspoon of cinnamon, and 4oz Sultanas if you like them. I left the icing plain but you could add cinnamon to it (leaving out the espresso). I only ever put a half quantity of icing onto the cakes and find that is ample, and I am never patient enough to make the drizzle to go on the top before cutting into the cake! This cake also freezes beautifully (cut into portions before freezing – you can ‘snap off’ the number of pieces you want to defrost) with the frosting on the top. Please don’t ask how long it lasts – we never have it for long before it is all eaten! And the fundraiser? We managed to raise just over £200 towards Jess’ target. I’m happy but exhausted. I think I deserve a cup of tea and a piece of cake. I have been pretty busy this week but had fun all the way. 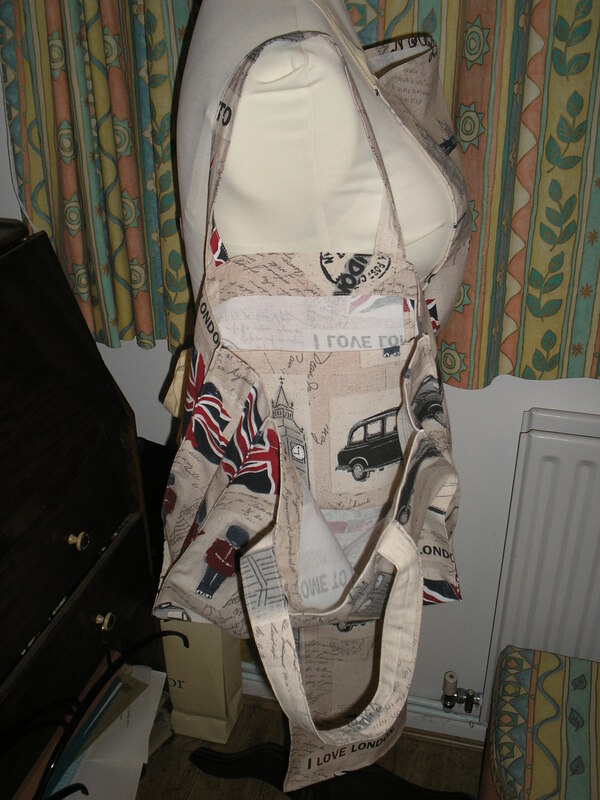 I have made four aprons, and six shopping bags ready for fundraising events. 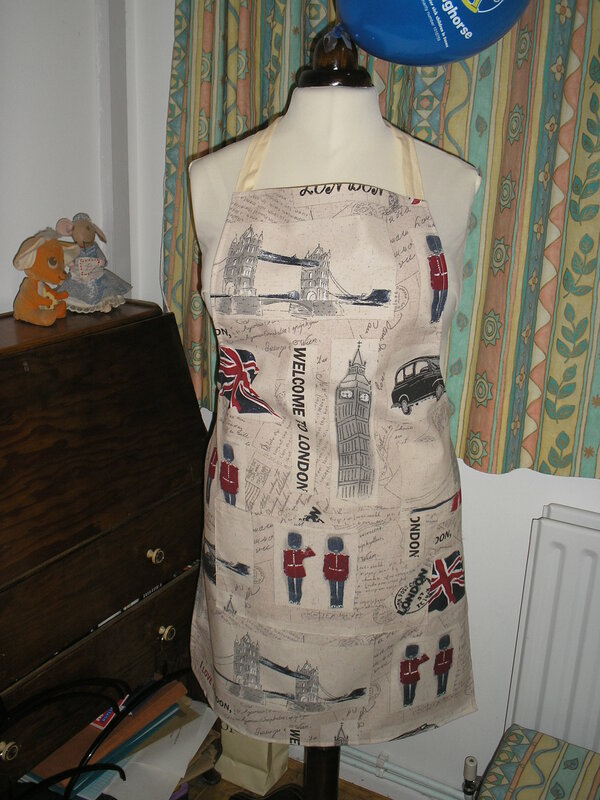 There are more items listed ready to make this week but I really wanted to make a start with things in this wonderful fabric showing the major sights in London. It is a lovely heavy 100% cotton that I am sure will be really hard wearing – and obviously washable since no-ones aprons (or shopping bags) stay clean for long. 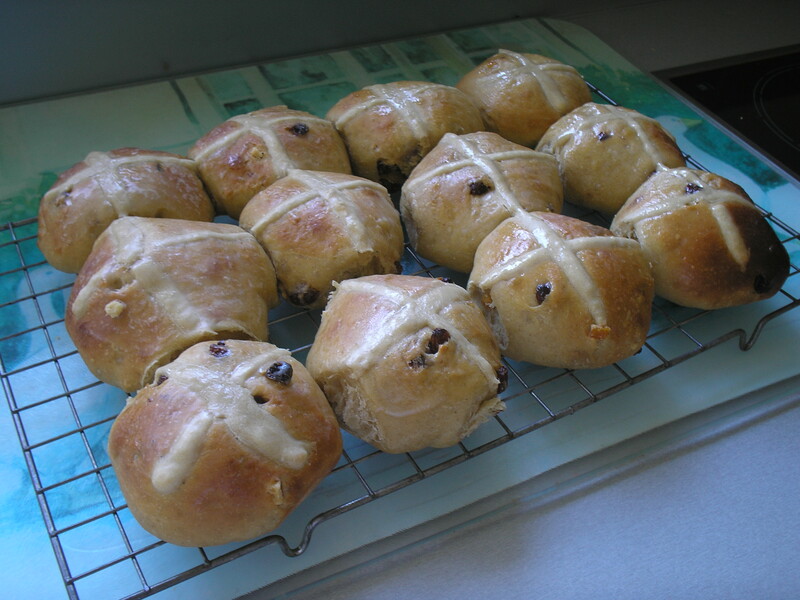 I would have liked one of these for some cooking I did myself this week – but not allowed! 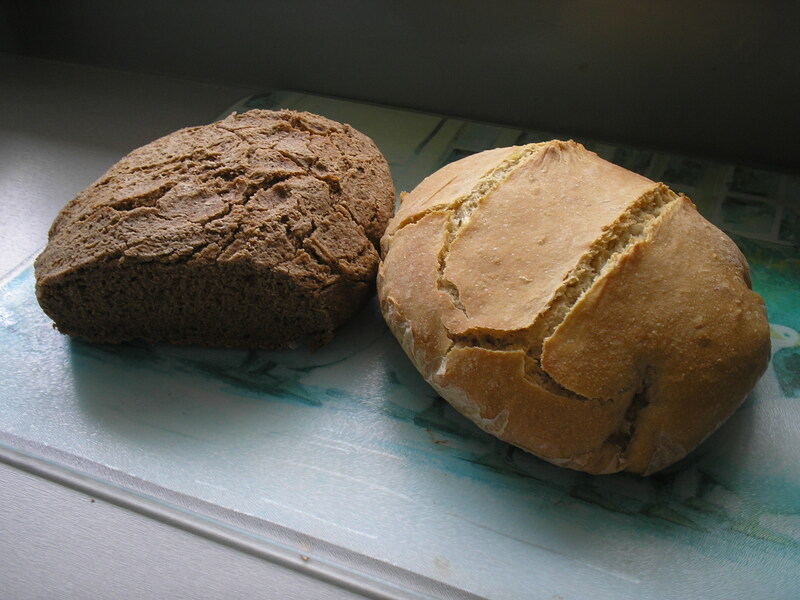 I have been making sour dough bread about twice a week since I was given my starter and last week was no different. I like real ‘loaf tin’ shaped loaves as they are really easy to cut and make into toast – and sour dough toasts brilliantly! Between client and fund raising sewing, cooking, and just general life there hasn’t been much spare time but I have eventually finished one of my ‘Little Minx’ socks. These are another toe-up pattern from Ravelry – and I have to say that the jury is out on this style. It has taken an age but only because this is the third time I have knitted this up. The first time I forgot to knit into the back of the knit stitch and the pattern wasn’t anything like as nice (it took a while to work out what I was doing wrong. Note to self – READ THE PATTERN PROPERLY). I love the yarn but at the moment I don’t love the sock. 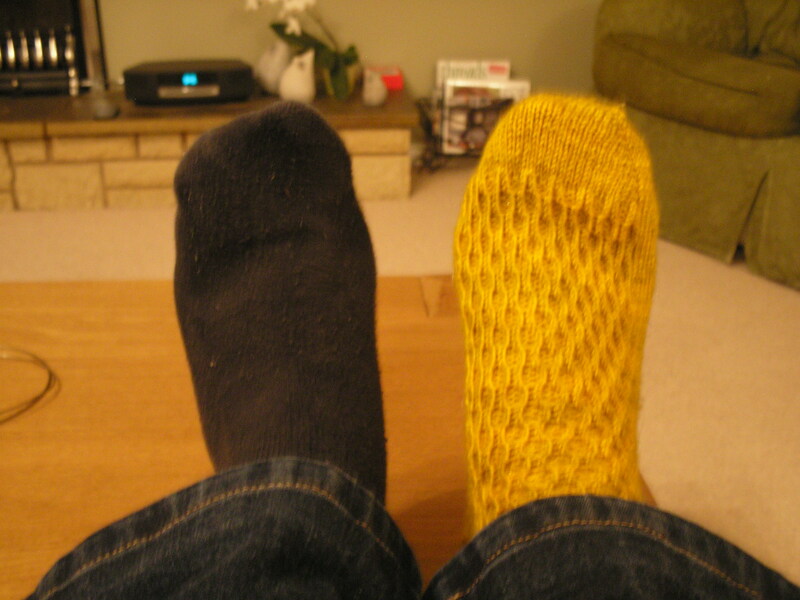 I have managed to make ‘pairs’ of every sock pattern I have made so far. I don’t want this to be the first singleton, but I think I am going to have to leave this a while before making the second. I have lots of sewing planned for this week – but I am also hosting a fundraiser for my daughters marathon at my home on Friday morning so I will be knee deep in cake mix later in the week. I hope they all work right. I will report on fundraising progress next week.